His playmaking peak is obvious. Coutinho’s game #36 in the Premier League saw the introduction of Liverpool’s 4-1-2-1-2 diamond on a regular basis. Luis Suarez & Daniel Sturridge were playing out of this world football, and Coutinho was able to feed them the ammunition to destroy much of the Premier League. As quickly as the 4-1-2-1-2 took effect, the departure of Luis Suarez caused just as sudden a change in Coutinho’s key pass numbers. 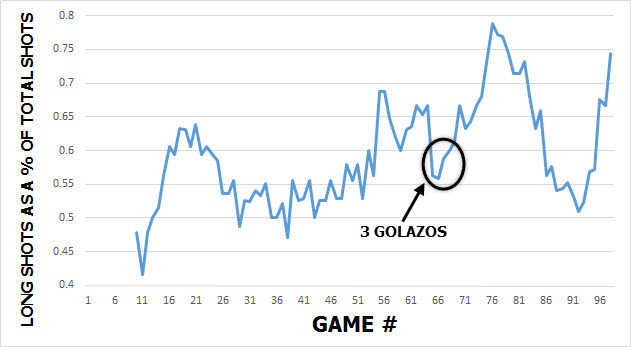 Game #46 was Coutinho’s 10-game rolling average key pass peak for Liverpool; and also the final game of the 2013/14 season. He suffered an immediate post-Suarez hangover, as his key pass numbers plummeted from roughly 4 to 0.5 over a 10-game average. That’s Mesut Ozil to Dejan Lovren, folks. Daniel Sturridge was available for Coutinho’s first two appearances of 2014/15, before finding a semi-permanent home on the injury table. Any playmaker going from Sturridge & Suarez to Mario Balotelli would have difficulty playing in the same way. But what particularly was it that Sturridge & Suarez did that allowed Coutinho such high key pass numbers in the latter stages of 2013/14? Coutinho had three main roles in creating offense within Liverpool’s attack that season (excluding set pieces, where Liverpool were markedly more dangerous from in 2013/14). The first was to pick 10-15 yard passes into Sturridge or Suarez to allow them to combine and break through the opposition defense with quick passing and fluid movement. Coutinho receives the ball in the centre of the pitch. There are a number of players in front of him. Both Suarez & Sturridge are capable dropping into the space between the lines or moving in behind the opposition defense. Both players are looking for the ball to feet here, and Coutinho delivers the pass to Sturridge. But the reaction of Suarez to Sturridge receiving the ball turns this into a goal. Once Suarez’s primary movement has been completed and he does not receive the ball to feet, he instantly makes a run in behind. The defender who was previously marking Suarez now has to defend Sturridge, and therefore Suarez’s run in behind leaves him as the man in space. We won’t comment on whether Sturridge was aiming to shoot or pass, but Suarez’s secondary movement after not receiving the ball to feet created the goal. You can see Skrtel & Agger are both forward from the previous corner kick, but both remain static throughout the images, because they don’t know what runs to make. Suarez has made two potentially useful movements in that time; first for Coutinho, and then for Sturridge. In our pre-season scouting report of Christian Benteke, we identified his movement as a potentially poor fit for Liverpool’s system. With a lack of creativity from wide, the attacking impetus tends to lie on the shoulders of Coutinho, who prefers to play centrally. Since Benteke joined, Coutinho has often played on the left, whilst cutting inside rather than delivering crosses from advanced areas. This means he spends most of his ball possession time in the left halfspace. But when the ball is in the halfspace, Benteke will often make a move to the other halfspace in order to make himself available for a cross. This is completely different to the movements Sturridge & Suarez try to make, who will attempt to break the opposition down with clever interplay such as the goal against Manchester United. Benteke also has completely different strengths in transition phases; the other key area Coutinho excelled in during the 2013/14 season. Of players with over 500 Premier League minutes that season, only Gaston Ramirez (with 511 minutes played to Coutinho’s 2338) played more through-balls per 90 minutes. Much of this through-ball threat came in transition. Rodgers’ Liverpool were at their most effective when pressing the opposition high and attacking in transition. Whilst Suarez was the key in the organisation phase, Sturridge is one of the best transition attackers in the world, and was able to link up with Coutinho on a number of occasions. Three through-ball assists to Daniel Sturridge, amongst many more. In many cases the thing that sets Coutinho apart in these situations is not his vision, but his execution. Whilst creativity & vision are needed to even attempt these passes, many top level players would see these passes. But the difficult part is in completing them successfully, and Coutinho has shown that his technique in these situations can be near-perfect. He can use the inside of his boot or the outside, as well as altering the pace and/or height of the pass depending on the situation and the player receiving the ball. The final example above (against Everton) illustrates an example where a pinpoint, ground pass was played with increased velocity, because of the closeness of the two Everton defenders to the potential pass trajectory. Whereas against Newcastle, a chip between the two defenders was in order to avoid wandering legs. The pass against Fulham was another chipped pass, but this time with curve from the outside of his boot in order to curve the ball away from the Fulham defender and allow Sturridge to utilise his pace advantage due to the increased distance the two players would have to run to reach the ball. Being able to understand the movement of his teammates and execute the required technique made things easy for Liverpool’s strikers. But that doesn’t really work anymore. Benteke is less adept at taking players on 1v1, and when running the channels in transition, often needs to offload to a teammate. He prefers not to make runs in behind, and is therefore only really a threat on the counter-attack when the ball is at the feet of a wide player. If Benteke is running the channel, he can often end up receiving the ball wide, an area where he is totally ineffective. Coutinho receives the ball, and Benteke doesn’t make a single helpful movement. Firmino fails to adjust to Coutinho shifting the ball past the man, and the attack dies. Neither situation provides the option for combination play in dangerous areas, which Liverpool of 2013/14, and Coutinho himself, thrived upon. The third major contribution Coutinho was tasked with making in Liverpool’s attack was progressing the ball into the final third having received it in his own half. Due to the poor defensive structure of many Premier League teams, and the fact he was often playing deeper than his current attacking midfield role, he would generally receive the ball in a deep position in 10 yards of space. This would allow him the opportunity to make use of one of his major skills; 1v1 dribbling. If Coutinho received the ball in space, it was almost inevitable that the ball would reach the final third and Liverpool could generate dangerous attacks. In an advanced attacking midfield role, the opportunity to do this is lessened. 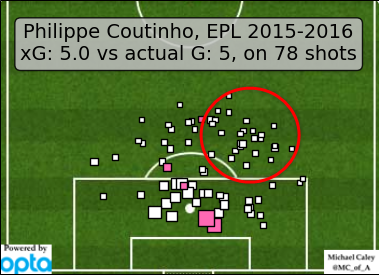 Alongside the decline of his playmaking influence, Coutinho has also developed the annoying habit of shooting from range far too much. Coutinho has scored a number of wonderful goals from Liverpool, and that seems to be his basis for taking so many shots from range. But his conversion rate of shots from outside the box is 3.74%. The Premier League average tends to fluctuate between 3-4%, meaning Coutinho is a pretty standard long-range shooter. So why does he take so many shots from range? There’s some more pretty clear trends here. 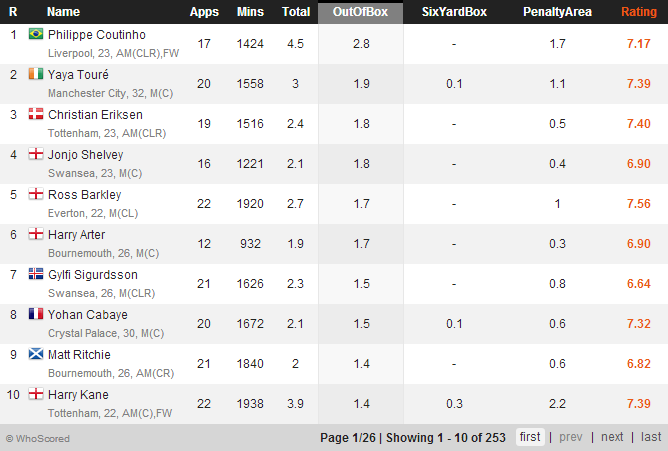 With in-form Suarez & Sturridge, Coutinho cuts his shot numbers. But unlike his key passes, that trend wasn’t reversed immediately as the 2014/15 season began. The introduction of the 3-4-3 in November saw his shot tallies rise as he was pushed into a front three. 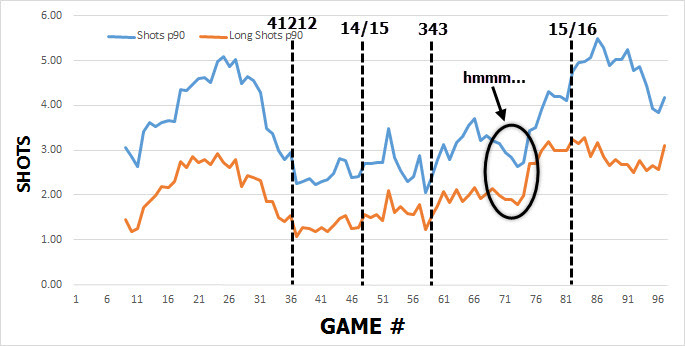 But even then, he was still taking approximately 3 shots per game. He was playing well as Liverpool went on a mini-resurgence in their new system. But he wasn’t scoring goals regularly… until early February. Within the space of a month, Coutinho scored three wonder-goals from range; against Bolton, Southampton, and finally, Manchester City. This short-term success seemed to convince Coutinho that shooting from range was the best available option. He managed to briefly reduce that at the start of 2015/16, largely through creating more shots within the penalty area, rather than shooting less from outside. 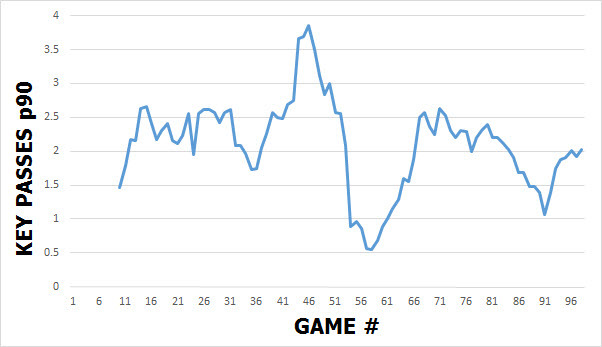 But recent form has seen that number creep back up to ~75%. Many of those come from the left halfspace area after cutting back inside from the left. What used to happen when Coutinho had the ball in those areas? Liverpool of 2013/14 were the perfect storm. They had two world class strikers who suited Coutinho’s playstyle in transition & organisation phases. But Benteke is the antithesis of Suarez in a number of ways. Because of a combination of the factors outlined previously, Coutinho’s first instinct upon receiving the ball ~30 yards from goal is now to shoot. Benteke is much more effective when receiving the ball from wide areas, and does not seem to understand what runs to make when the ball is in central midfield. We might see prime playmaking Coutinho again, but it won’t be with Christian Benteke in front of him. In the short-term, Jurgen Klopp could also look at moving Coutinho into a right-sided central midfield position. Much of the reason for Coutinho’s increased shot tally is his faith in that far-corner-inswinger-from-30-yards, which is obviously less likely to happen from the other side. Keeping Daniel Sturridge fit and partnering him with Roberto Firmino would go some way towards replicating the style of 2013/14 where Coutinho thrived. But something has changed in Coutinho himself, and that might be more difficult to get back. I think Coutinho is class, but like most players, tends to go for it themselves if they don’t believe there is a better option. Currently for him, there is not, bar the game against City with a whole bunch of fluid, mobile players around him. He is best as a front 3 player in these situations (games against top opposition, where the team has to be weary defensively), pressing from the front and linking up with the forwards, but leaving Liverpool with more solid defensive mid behind him. In tough home games against opposition who sit back, play Coutinho in a deeper role to pick the lock. I feel that with Sturridge, Origi, and Ings returning, next season will see the Coutinho of old will emerge. Less pressure to score, more options around him to be creative = less shots from range.